I actually made this cake awhile ago, and am finally getting around to posting about it. It was the first cold snap of the year, and I was really getting in the mood to bake fall-like things, but didn’t have a ton of time on my hands. 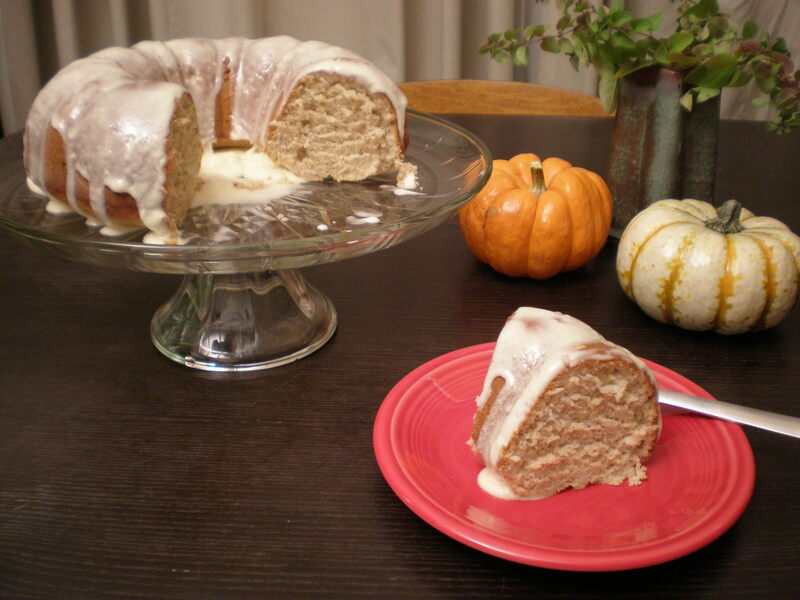 This spice cake was the perfect fix for my autumnal dessert yearning, and it was super easy to make. Also, the ingredients are things that most cooks and bakers have around all of the time, so it’s a great cake for your spontaneous baking repertoire. It’s perfectly spicy, and has a dense and moist texture. The browned butter icing adds the perfect amount of sweetness. Have all ingredients at room temperature, 68-70 degrees F. Preheat oven to 350. Grease and flour one 9-inch tube pan or one 8-10 cup fluted tube or Bundt pan. Mix until just incorporated, preferably by hand. Scrape the batter into the pan and spread evenly. Bake until a toothpick inserted into the center comes out clean, 45-55 minutes. Let cool in the pan on a rack for 10 minutes. Slide a thin knife around the cake to detach it from the pan, or tap the sides of the fluted tube or Bundt pan against the counter to loosen the cake. Invert the cake, then let cool, right side up or inverted, on the rack. Melt the butter in a medium skillet over medium heat. Once the butter is melted, constantly swirl the pan over the heat until the butter becomes deep golden brown, about 6-8 minutes. Remove the pan from the heat and whisk in powdered sugar and vanilla. Scrape it into a bowl and beat until smooth and spreadable. Use immediately, while still warm, so that it will pour over the cake more easily. Never thought of Browned Butter Icing before.